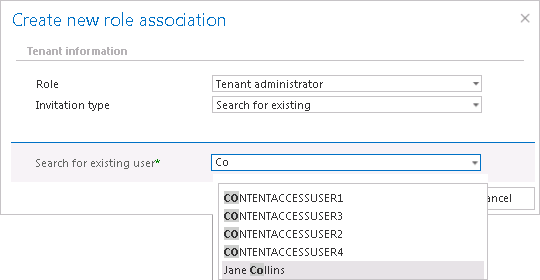 There are multiple options how to add a new tenant administrator in the Create new role association window. You can Create new user, you can Search for existing worker from the company or you can also Send an invitation to somebody who is not a contentACCESS user yet. Select the Tenant administrator role type from the Role dropdown list. If you select Create new, insert a Display name into the dialog first. From Login type list select the authentication provider configuration that this user will use when logging in to the system. Then fill the credentials (if Forms type was chosen then both Login name and Password) and click OK. Note: Only a provider configuration set up in Login providers control (System tab ⇒ Security ⇒ Login providers) can be selected from the list of login types. Forms and Windows are enabled by default. To the Search for existing user* field fill in part of name of the person you want to find. After you have selected the user click OK. This user will use his already existing credentials to log into Central Administration. Note: The invitation type can be used if user searching is enabled in the User search settings (more information here). This option enables for you to invite a person (who is not a contentACCESS user yet) to be a tenant administrator on your tenant. Select the Tenant administrator role type, enter the E-mail address* of the new user you wish to invite, and fill the Additional message* textbox which will be included in the email message that the invited user will receive from you. Then click OK. The invited person will get an invitation message from you. If the user accepts your invitation, he/she will be redirected automatically to the login page of contentACCESS. Here he can configure his authentication provider that he prefers to use for future logins into the system (this can be adjusted with navigating to System ⇒ Security ⇒ Login providers).